Barcelona has always been associated with design, so it deserves a museum that can gather all that heritage together. 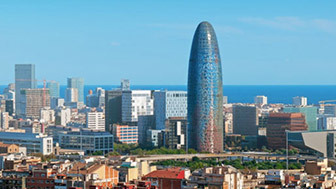 And the best place for that is the impressive Disseny Hub Barcelona building, made from metal and glass and situated in Barcelona's futuristic innovation district, Sant Martí. It looks like a giant stapler overhanging Plaça de les Glòries Catalanes. In fact it is the Disseny Hub building, which houses the Museu del Disseny de Barcelona. This new city architectural icon is in the 22@ neighbourhood, in the district of Sant Martí. Technology, innovation and a strong commitment to design mean this is a must for museum fans, who will see a collection of more than 70,000 items as a result of merging the collections of the Gabinet de les Arts Gràfiques and the Decorative Arts, Textile and Clothing, and Ceramics museums. The building will also house the Foment de les Arts i el Disseny (Fostering Arts and Design) association, the Barcelona Centre de Disseny and a major collection of documentary resources on design. A whole world of design gathered together in one, unique space structured on two levels, where one takes advantage of the different levels in the square, Plaça de les Glories Catalanes, and the other emerges at ground level. These are linked by a passageway that local residents are almost forced to go through and connects the remodelled square with the 22@ and Poblenou neighbourhoods. The glass and metal facade, combined with natural features such as the lake and the vertical gardens, adds a touch of green to the area. The building, conceived by the MBM team of architects, is a structure with a spectacular design and a very high degree of environmental quality. In fact, it is one of the most sustainable, energy self-sufficient buildings anywhere in the city and it has the highest efficiency rating. Design at the service of the city and a museum that captures the essence of Barcelona by uniting knowledge of the past with a forward-looking approach in an innovative space, as innovative as the neighbourhood it is located in. The 22@ district is an area that juxtaposes the most modern buildings with old factories. 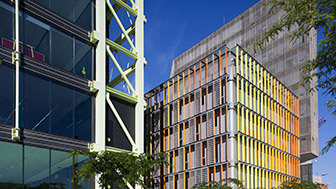 The MediaTIC Building is a symbol of the city's technological innovation.